But I now I’m asking for your help! 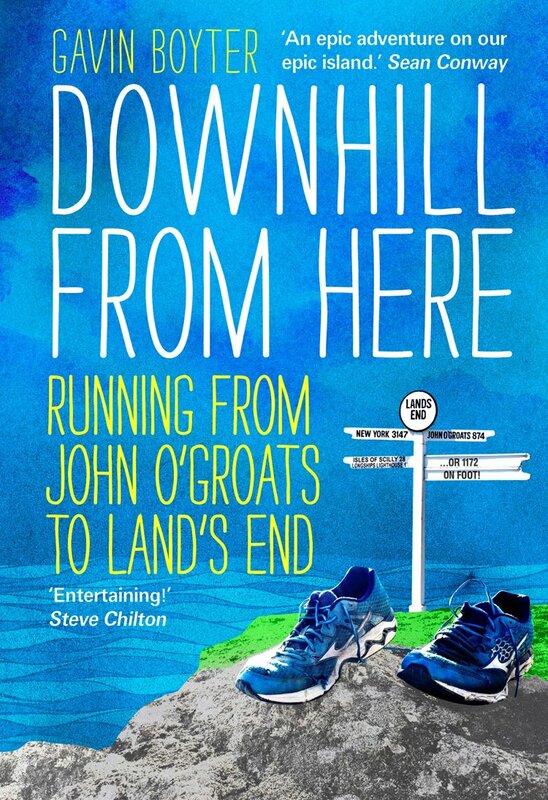 On September 1st 2018 I will be running an ultramarathon a day (an ultramarathon is any distance over a marathon) for 999 miles from John O’Groats to Land’s End. I will run solo, unsupported and carrying up to 14 kilos of food, water and camping equipment. My mission is to raise awareness of ‘under-the-radar’ veterans’ issues, such as mental health, homelessness and the shockingly high rate of suicide. As such, I am supporting the Baton foundation, a non-political, not-for-profit charity staffed entirely by unpaid volunteers. If you’ve read my memoir ‘Eating Smoke’ you will know I left the forces and ended up homeless in Hong Kong and in severe psychosis from crystal meth addiction. But my struggle began back in the UK, where I spent two years suffering from chronic depression and PTSD. My friends disappeared and I avoided all professional help because the medical community couldn’t understand the mindset and experiences of a former service person. I was lucky. When I finally crawled out of the darkness, a fellow former marine working for the Royal British Legion stood there ready to help. Following a brother-to-brother chat, he secured me a career development grant and I went on to volunteer my services for free teaching and mentoring streets kids in Africa. In fact, I not only worked in post-war Mozambique but went on to achieve every goal I ever dreamt of, including graduating with a degree in youth work and become a bestselling author. And now I hope to inspire others who are struggling. I’ve done almost no training for this #999miles challenge, having spent two years in constant pain from degenerative spinal injuries – in fact, my most recent operation was last week. It’s only following four hospital procedures and months of physio that I can run – well, hobble – again. I have a neurological condition called Post-Acute Withdrawal Syndrome, a form of brain damage caused by long-term use of opiate medication. As a result, I have slowed-down thinking, limited sleep, constant headaches and spasms in my legs when I’m even slightly dehydrated. You can run with me, or donate £5, or simply share this #999miles challenge on social media. I can tell you from personal experience, you will make a difference. Anyone who’s picked up a backpack since the 90s will have heard of the ‘Damage Done’, the story of Warren Fellows, who served twelve years for drug smuggling in Thailand’s toughest prison . 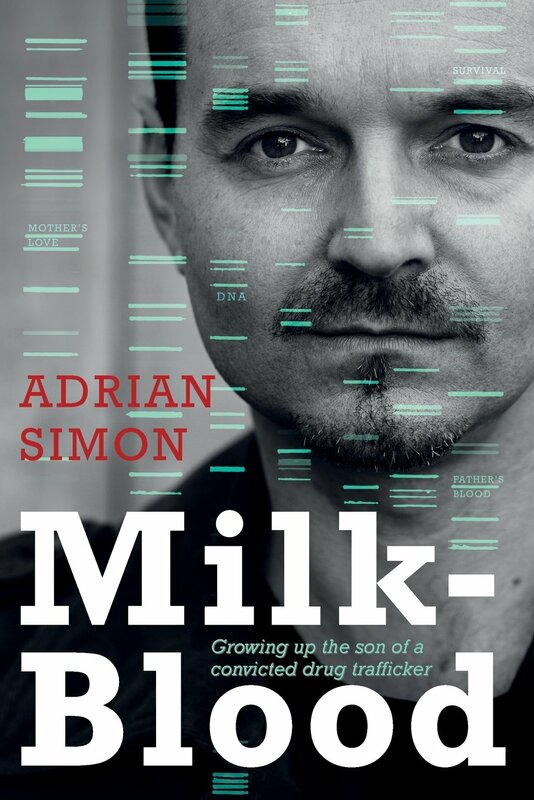 Well, ‘Milk Blood’ is written by his son, Adrian Simon, and is a amazing story in itself but one that also adds the degree of balance to his father’s book; namely, filling in some important background. Adrian is a likeable narrator and it is all credit to him that he has grown up as such a well-balanced individual and has written this riveting account. It is the only full-length book I’ve read in one sitting. The Trade is the second book in the series and I’m very happy with the clever follow-up! First off, I don’t profess to be an expert. But I did put together a 230,000-word manuscript in six months with only a high school qualification in English. Then having taught myself how to improve my writing and editing I figured a way to get a publisher to approach me – rather than the other way around. So this humble advice is for those of you who, like me with Eating Smoke, have a story you want to tell but limited knowledge on how to go about telling it, let alone seeing it through to print. ‘Exactly!’ said my friend, with a grin. Not only did his impromptu English lesson make more sense than any I’d attended at school, but it earned me straight As for the first three assignments I posted off, with a note attached to the fourth feedback informing me I should take the English exam right away instead of seeing the year-long course through. I did and passed it, and that’s the only experience I had of learning English before writing Eating Smoke sixteen years later. The aim of this free download e-book is to encourage you to go from procrastination to completion of your manuscript with easy-to-understand instruction and by adopting a pragmatic approach, allowing you insight into the art of good writing as you progress. It is not intended to be a comprehensive grammar, punctuation and stylistic guide. There is an abundance of these already available in the marketplace that you will naturally wish to invest in as the writing bug takes hold. Work out which part of your story the target audience will want to read about. This may sound obvious, but you should decide if you’re writing a memoir – a period in your life – or an autobiography – your life story. This will help you to keep focussed and save time on editing. Backstory is your history – everything that has taken place in your life until now. Backstory can add valuable insight into your character(s), but it can also sidetrack the reader and become boring. If you are writing a biography, it’s all going to be backstory. If you are writing a book entitled My Month in Tibet, then backstory isn’t going to play such a prominent role. Either way, backstory doesn’t need to be volumes; nor does it have to be set out in chronological order like a diary or journal. You can take snippets of appropriate backstory and slot them into the manuscript at pertinent moments. I picked up the receiver and heard Sarah’s voice for the first time in what seemed ages. It must have been close to midnight back in the UK – maybe she’d had a drink and got a bit sentimental. Spend time typing up everything you can remember that you feel is relative to your memoir. This might require some research and should include incidents, events, characters, conversations, relationships and appropriate backstory. Get it all down, in no particular order, and then arrange these key recollections into a rough timeline of events using cut and paste. Then you have to be ruthless with the delete button by applying a rule of thumb. Note. If you spend a couple of evenings making your list over a glass or two of your favourite tipple, you’ll find that embarking on a memoir is easier than you thought. Not only is this a fun way to go about it but you’ll leave the ‘I’m-thinking-of-writing-a-book’ mindset and join the ‘I’m-writing-a-book’ one. A rule of thumb is to leave out narrative that doesn’t take the story forward by adding to the understanding of your character(s), the situation you are describing or the outcome of events. This includes irrelevant anecdotes, unnecessary backstory and other off-subject matter. In short, no one needs to know your favourite colour or read about the kid who had a crush on you in high school (unless it adds to the understanding of your character(s), the situation you are describing or the outcome of events) but they might like to learn that falling out of a tree as a child gave you a fear of heights if your story is about conquering Mount Everest. Even if you don’t intend to have a prologue, I’d suggest writing a short one. You can always delete it later. The reason being, it’s an easy way to slip into the writing process. It will give you an idea of what your story’s focus and selling point is and you can show it to friends and start getting feedback as a ‘writer’. Tailor your prologue to suit your type of book. Short and to the point appears to be the current trend. * A bit of humour can work, too. * If at all – hence, you can delete it later. In 2004, I worked in a mental health unit. People often asked, ‘How can you stand it with all those nutters?’ I’d quote from the textbook: ‘It’s a misunderstood condition affecting one in four people at some stage in their lives.’ I never told the real reason. I worried that knowledge might confuse them. You see, in 1996, I went mad. If you’re not an A-list celebrity with a top-notch publicity team behind you, you might want to make your first chapter the ‘hook’ – a harrowing, pertinent or exciting moment – to engage readers, agents, publishers and yourself. The only thing still familiar was the eyes – although now they were bloodshot and yellow with pupils raging deep and menacing. I wondered if these black abysses could dilate further, triumphing over the turquoise rings around them, heralding the madness had claimed my soul. Pick the first event in your timeline and write about it. Ask yourself, ‘Does this anecdote take the story forward or add special interest to it?’ But most of all, WRITE! WRITE! WRITE! Go for it! Get as many words down on paper as you can every day. Before you know it, you will have a manuscript. Don’t worry about getting it perfect, as you’ll glean a lot from books, Internet sites and your own intuition as you progress. You can then employ your newfound knowledge in the editing process when it all starts to make more sense. To continue reading, click the link. Thank you.